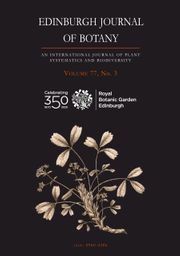 Edinburgh Journal of Botany is an international journal of plant systematics covering related aspects of biodiversity, conservation science and phytogeography for plants and fungi. The journal is a particularly valued forum for research on South East and South West Asian, Sino-Himalayan and Brazilian biodiversity. The journal also publishes important work on European, Central American and African biodiversity and encourages submissions from throughout the world. Commissioned book reviews are also included. All papers are peer reviewed and an international editorial board provides a body of expertise to reflect the wide range of work published and the geographical spread of the journal’s authors and readers.